My DIY + Vegan Version! 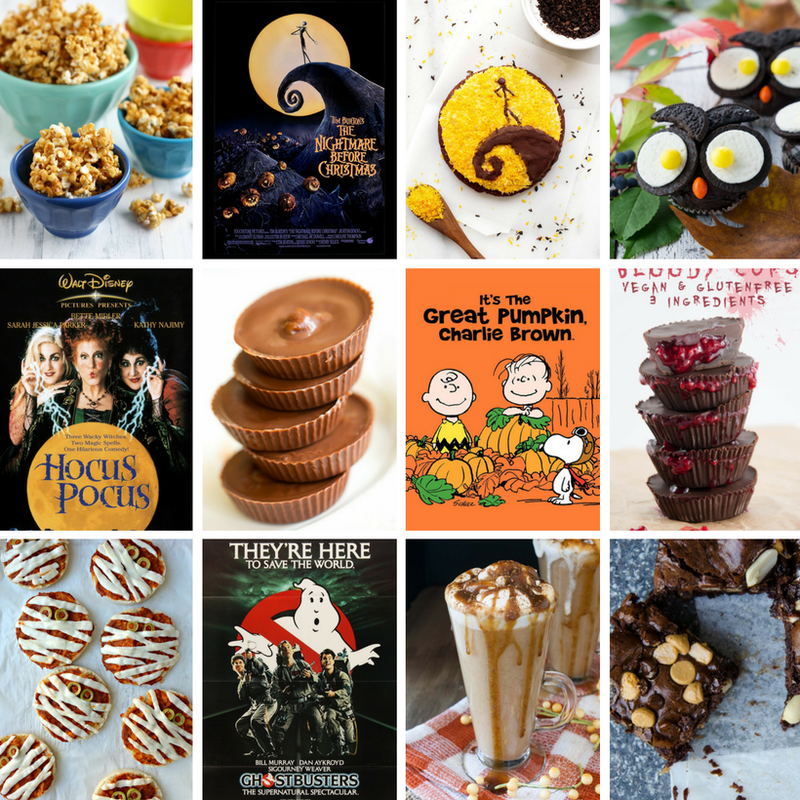 All things Halloween are eating up my feed right now, and I am loving every scroll of it. Costumes, spooky things and Halloween movie references. My personal fave October movie: Hocus Pocus. It sets such a cozy, spooky, fun fall mood. The crisp fall leaves. The warmly-lit homes, all smushed together on a friendly street. Warm apple cider. Costume parties. I mean, the main character, Max, may have hated moving from California, but come October, I wouldn’t mind living in his new Halloween-decked-out ‘hood … well, minus the three youth-obsessed, children-eating, vocally-talented witches of course. Oh, Witches!! Ha. I knew that story had a point. 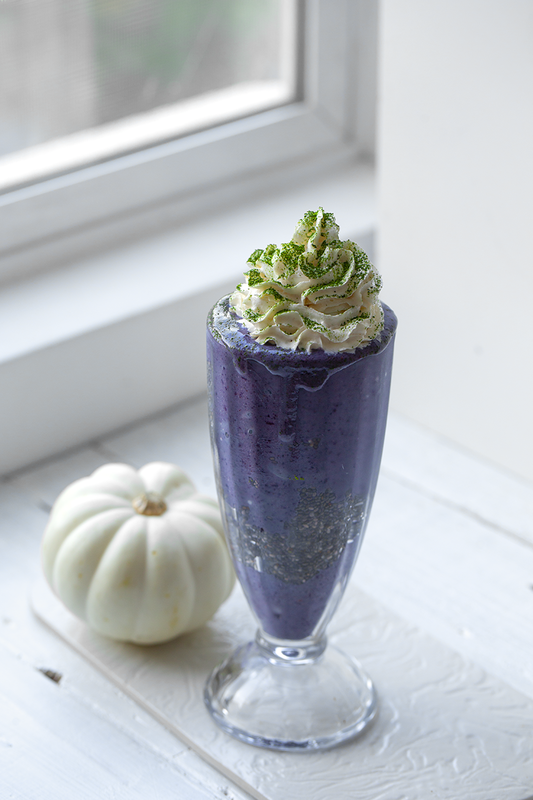 Today I am sharing my copycat, DIY version of the Starbucks Halloween Frappuccino. 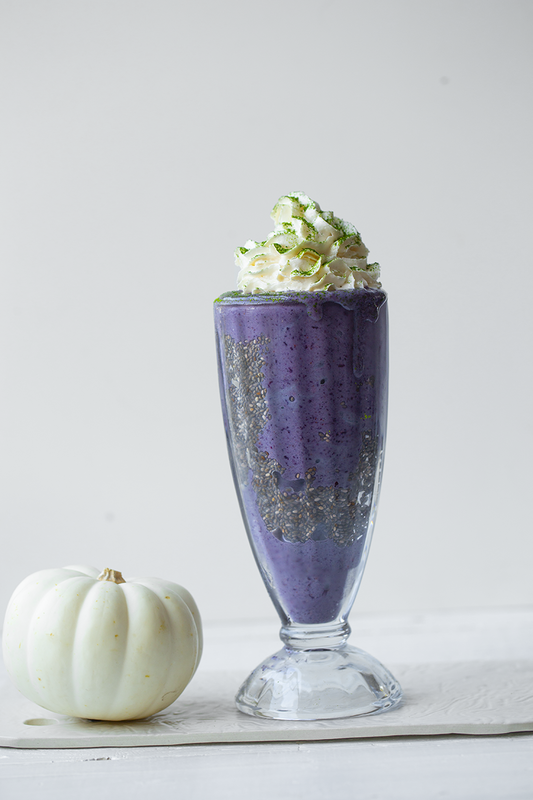 Meet my DIY ‘Witchy Brew’ Smoothie. 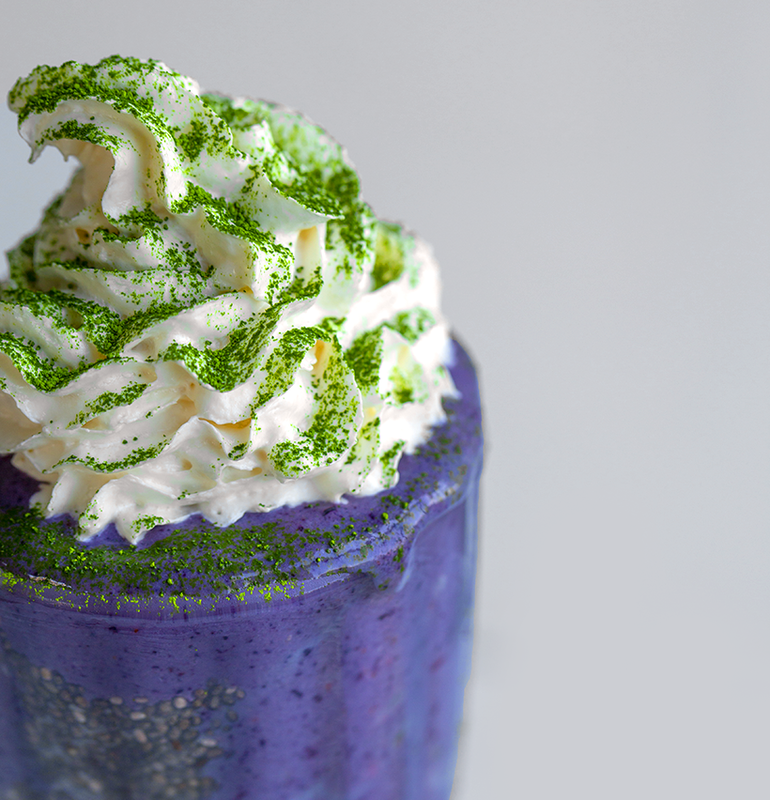 I had so much fun DIY-ing the famous Unicorn Frap a while back, that I had to give this new one a twirl on my broomstick. 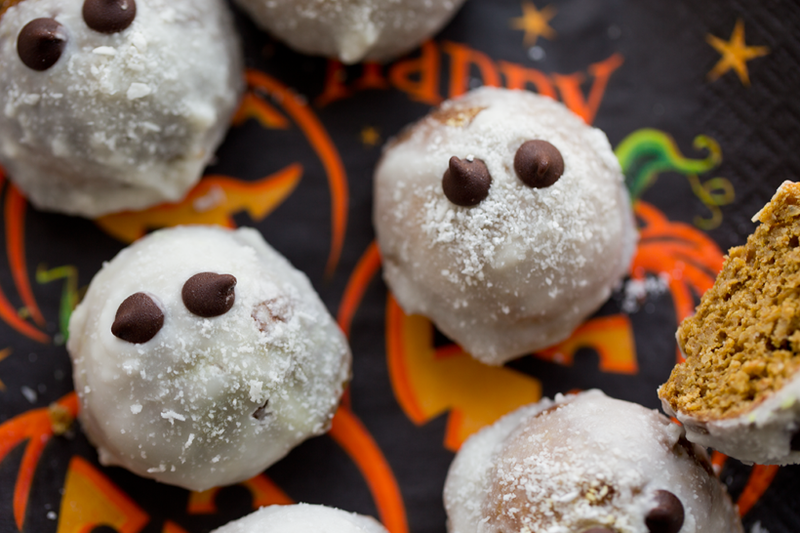 Get the recipe, plus more fun Halloween recipes ahead!.. 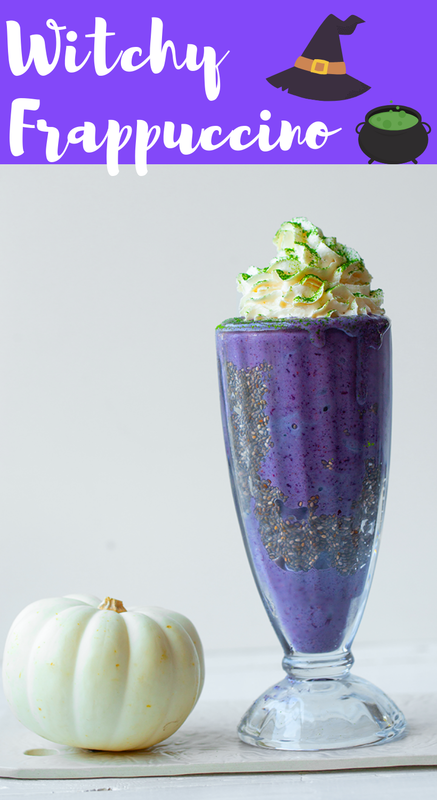 Witchy Brew Smoothie. So after seeing the #WitchesBrewFrappuccino hashtag on Twitter today, I got curious about this seasonal special. I am always so inspired by the fun (random!) drinks that Starbucks releases during holidays. It’s fun to craft vegan versions of them at home! A little digging on Twitter showed that people love this drink because it tastes like Creamsicle. 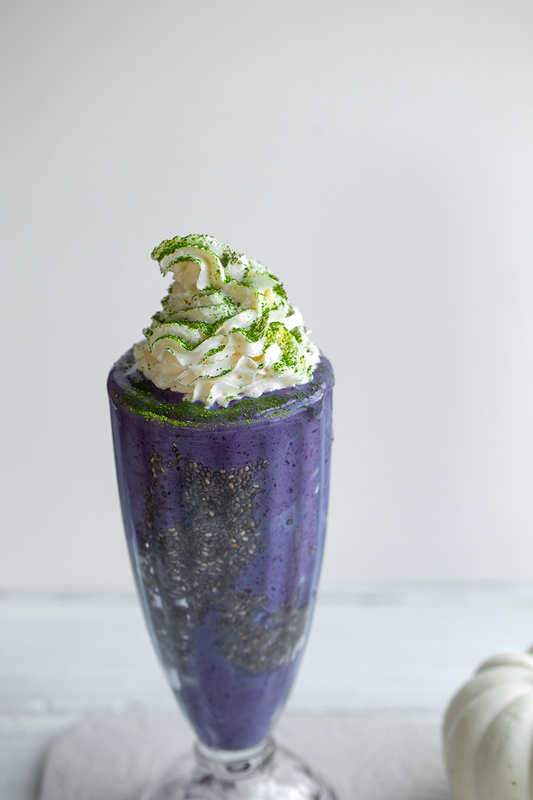 So while I could’ve just easily pointed you guys to this Creamsicle Smoothie recipe, I decided to do something a tad less citrus, and a bit more purple-berry in flavor. So while you still get a hint of citrus from the juice and zest, you don’t get an overly orange flavor. If you DO want a super citrus flavor, try this: make my Creamsicle smoothie and add 1/2 cup of blueberries, to tweak the color a bit. The chia seed “warts” are really easy to make and add a fun texture to your smoothie. Plus a nice nutritional and fiber boost! 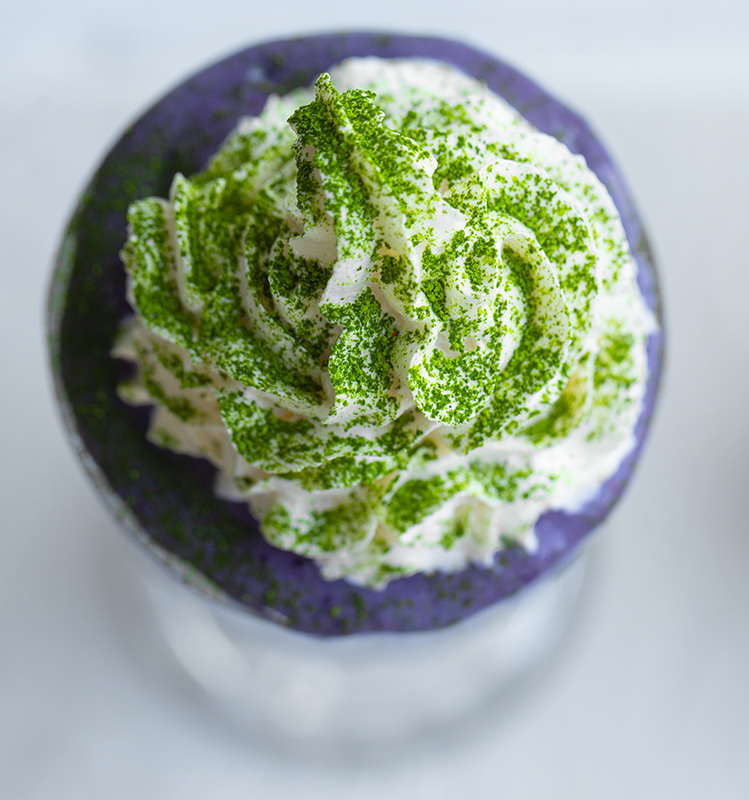 The green color on top can easily be achieved using matcha powder. Something you guys know I always have on hand! If you do not have matcha, you could use spirulina powder too… but that will not taste as yummy. For the purple color I used acai and blueberries. Pitaya could also be used because it has a rich pink color! And the frozen banana really adds the perfect dose of sweetness and creamy texture. For my citrus accent, I added some fresh OJ + a generous pinch of the fresh orange zest. Use as much as you’d like! 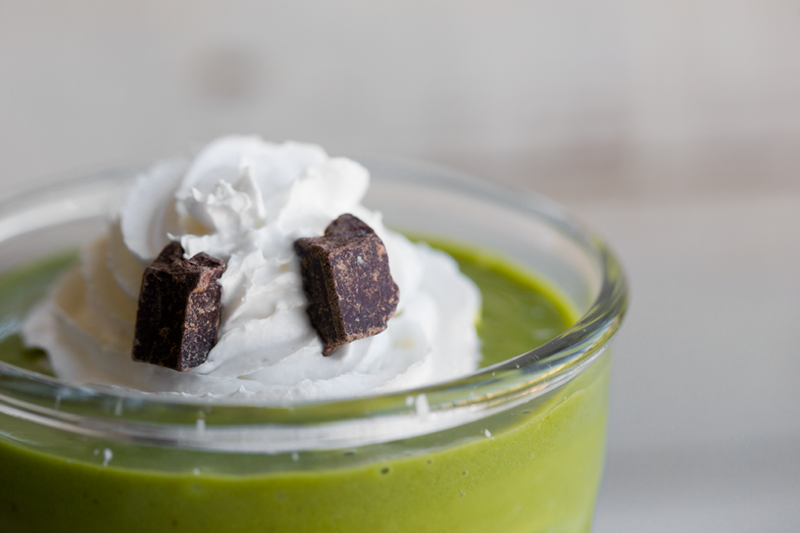 Orange zest is really uplifting and lovely in this smoothie. For the “whip,” I used rice whip that I had on hand. But you could do some DIY coconut whip or use another vegan whip that you find at the grocery store. There are actually a few brands on the market! Or skip the whip and just go all in with the purple part of your shake. Those movies! 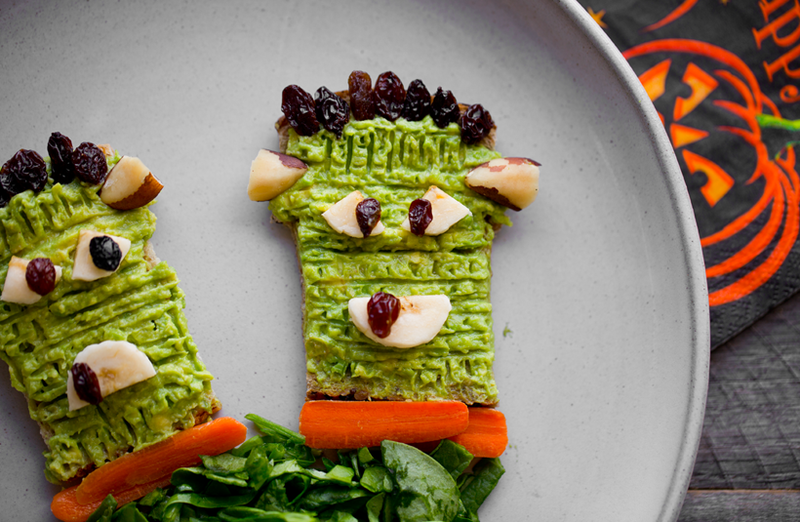 Definitely check out this fun post if you are looking for Halloween movie + recipe ideas..
A few more spooky recipes – Halloween toasts..
Or try a Monster Matcha Mash Shake.. 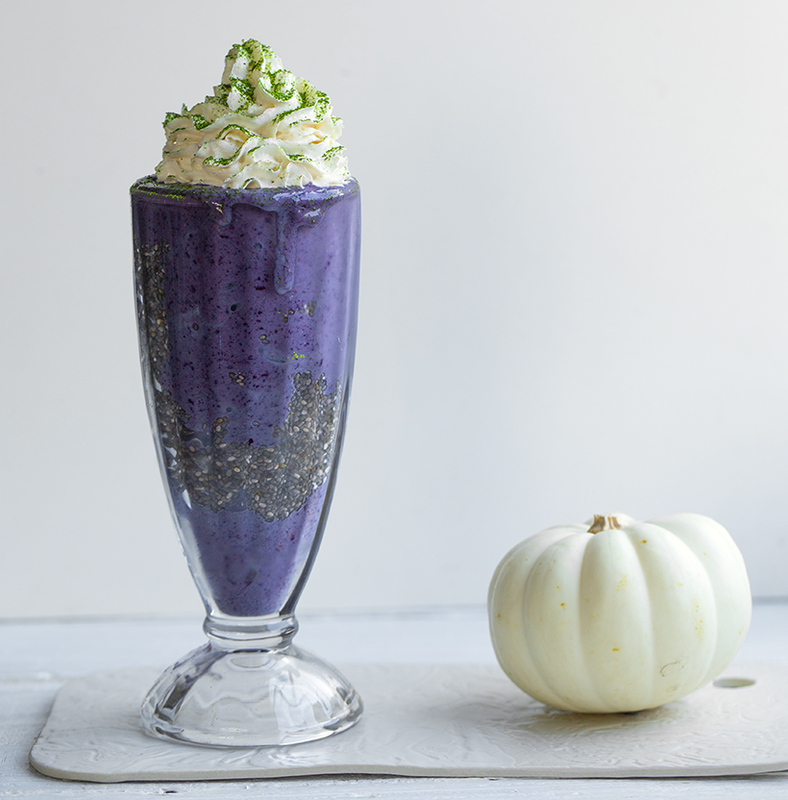 This vegan, spooky smoothie contains a creamy mixture of banana, acai, blueberries and orange. Those spooky lumps along the side? Chia seeds of course! Combine the chia seeds and warm water. Whisk briskly, set aside to thicken a few minutes. Add the non-dairy milk, orange juice, zest, berries and acai to a blender. Blend until smooth. Paste the chia seeds along the inside of your serving glass. Then pour the smoothie in the glass. Top with your non-dairy whit. Sprinkle the matcha over top. Enjoy! Cook time: 00 hrs. 03 mins. So… the big question… what are you guys going to be for Halloween? Me, no clue. I will whip something together at the very last minute, as usual. Prior to that, I will probably spend a few mindless hours trolling a costume store with my husband trying to get ideas but then never actually buying much. Anyone else do that? 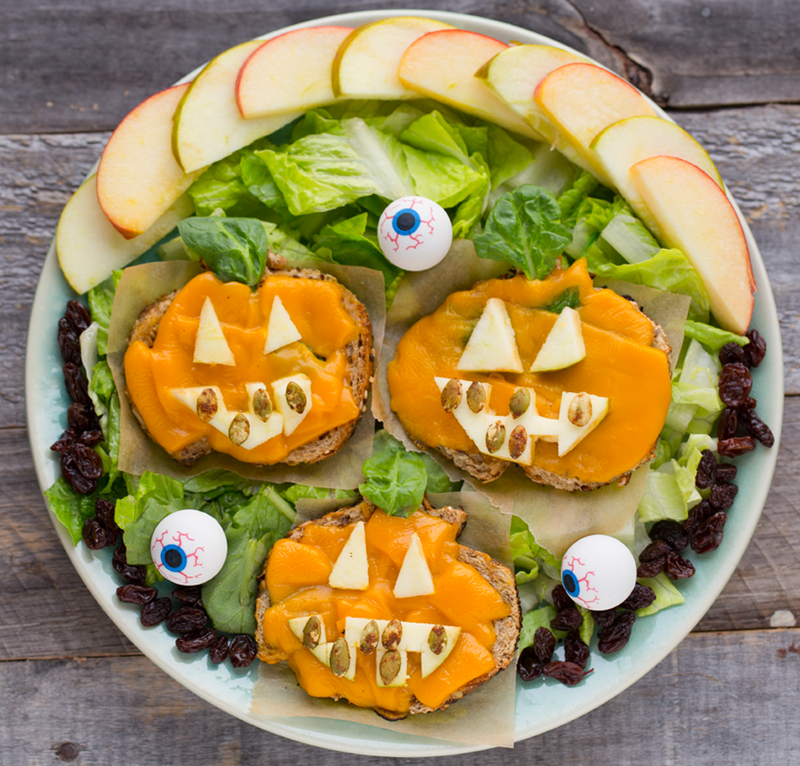 Ok, happy spooky smoothie making guys, hope you are having a good week!